Never been to Wembley and I'm hoping this year could be the one. Well, I'm Salford-born and bred. I have been a fan through my old fella since the Mid to late 70's. 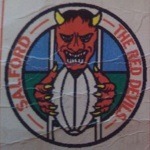 Due to us residing near the Willows as a teenager, my life was utterly fulfilled with sport especially''Salford RL''. I used to even watch the squad train on them cold Tuesday and Thursday nights took by Kevin Ashcroft and Terry Cassidy, and I'd even watch the ''A Team'' play on a Friday night. I was totally hooked. In my late school years, I was lucky enough to represent Salford Boys, however, I played my amateur Rugby League mostly in Warrington before I was poached to play for Salford Academy in it's introductory year, I played for Two Seasons which was a great experience where we got to train with the full squads which gave great insight into the full nuts and bolts of the club from another perspective.. Eventually, my best mate signed for Salford that year having a barnstorming season. I still attend intermittently as my enthusiasm seems to be dying off year by year since the move to Barton. I barely recognise people anymore on match days whereas the Willows I'd be non stop saying ''hiya and see ya later'' to fellow familiar Salfordians. I'll always adore ''The Great Sport Of Rugby League'' but I'm not feeling the "Love'' of the move. 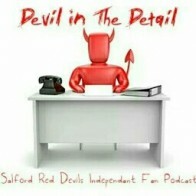 like ''Most Salford Residential Supporters'' don't. It seems like the exiled supporters or the outer ring of our border supporters are in favour of it.The Real Salford people are slowly ebbing away, which I can totally understand. It doesn't feel like ''Proper Salford'' anymore. I'm not being negative I'm just speaking from the heart and stating a glaring honest fact. Morning all! I'm Matt.... 38 years young and (for my sins!) been a Salford fan since 1989. Brought up in Higher Broughton (the posh end!) and managed to avoid Lowry High and Kersal when my parents sent me over yonder to Hope High. And that is where I was introduced to Salford RLFC through the Junior Devils scheme.It's been a mostly painful 27 years but I guess it's balanced out the fact I've been spoilt as a Man Utd fan and kept my feet on the ground a little! Obviously the Wigan cup win ranks up there in my top 3 sporting moments and like most Reds I'd love to see us walk out at Wembley one day or in the GF at OT. Imagine the glory hunters that would appear! Away from Salford Rugby I'm into pretty much any sport and regularly at Old Trafford (football and cricket) and also Salford City FC. I can also be found hacking around local golf courses from time to time! Most talented player? Without a doubt Rangi and a criminal shame he's a balloon (like Hock) and wasting the best years of his career! Last Edit: Apr 21, 2016 6:52:11 GMT by salfordslim: Doesn't appear to like smilies so just tidying up a little! The Willows always will be a special place in every Salford fans heart and I miss it every day. Whilst technically it may have been a dump it was "our dump" and full of character. Unfortunately in this day and age shiny stadia is all the rage and moving from the heart of Salford did rip part of the soul out of our club. However, the real soul of every club is the fans and WE can put that back into the club.... Look at the numerous football clubs that went bust and reformed and the new lease of life their fans got from rebuilding their own club. That was almost us and we got lucky when Dr K rescued us. Grew up just off Chandos, so I guess it was inevitable that I would become hooked with Salford RLFC with the Willows just a stones throw from where I lived. The first game I can really remember is the 1997 World Club Championship game vs Adelaide Rams which we won 14-12, a remarkable feat when looking back. There were over 7,000 in the Willows that evening. Special memory for me. I stayed in the Shed ever since the day we moved. I went to school in Salford, I went to college in Salford, I went to uni in Salford and I had my first couple of jobs in Salford. I still live here now, but have moved out into Worsley. Job wise I'm a Quantity Surveyor and work in Manchester so still close enough. I tried the South Stand when we first moved to the AJ Bell, but hated the view. Moved across to the West and loved it. I now reside in a box so have the perfect view and some decent food before the games. Quite a change from the Shed! Quantity Surveyor? Worsley? Exec Box? Your type isn't welcome on here! I can remember the big tea hut where the north stand was, the pavilion in the corner, the shale slope where the variety centre was built. the old score board, north stand end. Hello. Great to see already lots of names from the past I recognise on here, Only became aware of this forum today (Had a few busy weeks). Used to watch the rugby games on ITV in the late '80s that they showed on a Saturday afternoon, One afternoon I tuned in to find that a team called Salford were playing against Leigh in 1989. The moment I was aware we had a team in the area, I was hooked (we also won which helped). First attended game was not long after when we next played at home against Widnes and it was the first sporting event I ever attended and also the night I first fell in love. Since then followed Salford religiously through the good(?) and the bad but can say it's never been dull. Hope one day we eventually reach the pinnacle again but I, like pretty much every Salford fan I know, would just settle for a trip to the capital in late Aug to watch the boys play in the CC final. Born and bred in Salford and proud to call this city my home wherever I go in the world. Started going to the Willows during the Glory days of the 1970's. My Dad would nod to the man working the turn-style and lift me over. I Didn't really understand what was going on and was more excited about running onto the pitch at the end to get the odd autograph and Keith Fielding's tie-ups. I Can still remember the smell of the liniment rub which was on the tie-up now. When I left school in the early 80's I'd lost interest in Rugby and was more interested in United. Moved away from Salford at the end of the 80s to live with and then marry a Yorkshire Lass. Only in the last 5 years I've started to first follow the results and now and try and catch the odd game. My Dad is still Salford mad but due to ill health struggles to get to the AJ Bell. I'm probably the first non Salford fan to register on here. I'm from Cas but now aged 69 and retired to Bridlington. I used to post on the old board occasionally and have been fairly well behaved after getting off to a bad start over a post about the Mark Sneyd loan. I recognise some of my old sparring partners on here and hope we can carry on with the friendly banter. Welcome mate. 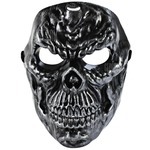 This place is for anyone who wants to have a decent chat about RL. Congratz on the well earned win today. I'm manchester born but grew up in Rossendale. My RL experience as a child was restricted to the odd bbc televised game and yearly visit to relatives in Widnes where we would pop to naughton rd and catch the match. This was late 80s. My experience with salford began mid 90s (once I could drive) and friend and me would come down to Willows a couple of times a season. Other than that it was sky tv. 3 years ago I moved to trafford after years of working in salford. I took the opportunity to get to the game more often and am averaging 80% home fixtures and 2 or 3 away games. I love it!